Cast members of "An Octoroon" at the Wilma Theatre. Photo: Alexander Iziliaev. Where to begin? 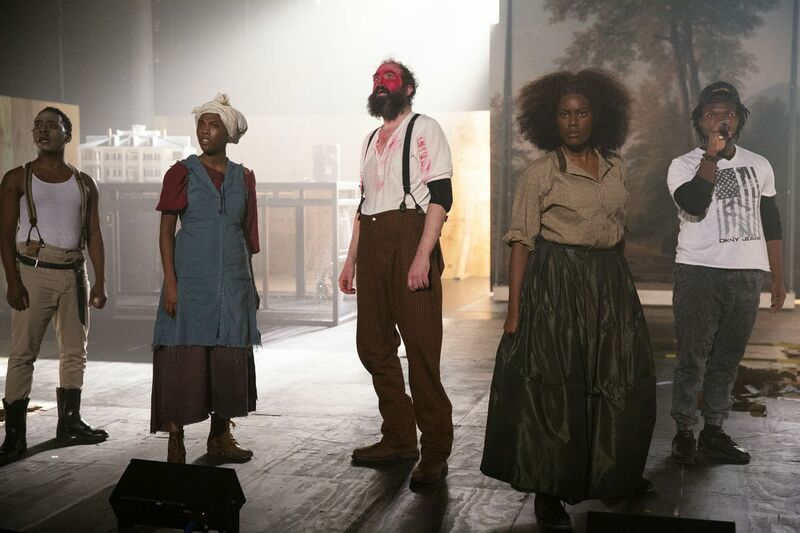 A knockout production of An Octoroon, by Branden Jacobs-Jenkins and directed mightily by Joanna Settle, has just opened at the Wilma Theater. Well, it's not exactly by Jacobs-Jenkins, but rather radically reimagined and adapted from a 19th-century melodrama by Dion Boucicault called The Octoroon. So this is a contemporary play - note the An in the title rather than The - about theater history. Boucicault's play is about slaves on a plantation in the Deep South - this is Tara territory - and is thus about racial injustice (radical in itself, since the original play predates the Emancipation Proclamation). There are wondrous moments when the melodrama carries us away as we fall for the sentimental plot. Then Jacobs-Jenkins' radical play takes over. It, too, is about racial injustice and the legacy of the antebellum South. But like most contemporary plays about serious issues, it's not only serious, but also funny. The actors - and this is a superb cast - double and triple roles, and each reappearance grows in significance. A black actor wears whiteface; an Asian American actor wears blackface; a white actor, playing an Indian, wears redface. Most startling is the image of one of the slaves holding her baby; the baby is played by a blond doll wearing blackface. Taysha Canales, Jaylene Clark Owens, and Alina John are hilarious as the up-talking, smart-mouthed, now-sounding slaves. The three central roles are the 21st-century playwright (telling us how hard a time he's having writing this play and then getting it produced), a liberal Southern gentleman just returned from Paris, and a murderous Southern slave owner, all played by the remarkable James Ijames. Each has his own costume, wig, and accent, and Ijames switches among them with lightning agility. A scene where the two 19th-century men fight with each other at a slave auction (first slaps, then knives) is stunning: He is literally and figuratively fighting with himself, enacting the white man's dilemma. Only, Ijames is black. An octoroon is someone one-eighth black, enough to classify a person as a slave, and enough to make it impossible and illegal for the Southern gentleman who loves her to marry her. Campbell O'Hare is lovely in the role, never violating the melodramatic circumstance of her character. In contrast is the Southern belle played with a wink by Maggie Johnson. She just gets better and better, using her icy blondness to great advantage. The excellent Ed Swidey plays Boucicault, the Indian, and the auctioneer. Justin Jain plays both an old broke-back slave and a young boy. Oh, there's a band onstage in the middle of all this multilayered drama: Ill Doots ranges from hip-hop to delicate, creating music that defies the theatrical rules of soundtrack: They are live and very present. Wait, there's more: Two real chickens, live and onstage. And a large, surreal rabbit. Aaron Bell plays the rabbit; the chickens play themselves. Through April 10 at the Wilma Theater, Broad and Spruce Sts. Tickets $10 to $25. Information: 215-546-7824 or wilmatheater.org.